This months Daring Baker’s chellenge is Tiramisu, so I have decided to start on this rather intimidating but very exciting project this week. It takes about 2-3 days to make due to refridgeration times required, so I thought I’d start last night, construct it tonight, and then it will be done by tomorrow when I have a friend (aka Guinea-Pig) coming over for dinner who I would love to impress with a made-from-scratch culinary masterpiece. Now I will not be able to show photos of the finished creation until the official Daring Bakers reveal date on the 1/3, but I can show pictures of the process of construction, which is not a simple process I’ll have you know. The challenge includes making Marscapone from scratch, which I started last night and am praying actually looks like marscapone and not butter/curdled cream when I come to use it later. 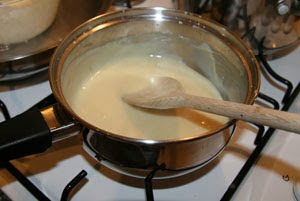 Last night I also started the Zabaglione (is that or is that not a very fun word to say?) and the Pastry Cream which require overnight refridgeration before use. The Zabaglione involved Egg Yolks and sugar and the liqor (Tia Maria in this case), and the Pastry Cream is egg yolk, sugar and milk made into something similar to an egg custard’s smooth & creamy consistency. Both smell delicious and I can’t wait to use them in the construction process tonight. The plan for tonight is to make the Ladyfingers/Savoiardi (Sponge finger biscuits) which will be interesting as I have never done anything like them before. If they turn out acceptable I will then construct the Tiramisu and hopefully it will be a beautiful and delicious masterpiece (I believe in the power of positive thinking!). So until tomorrow, fingers crossed and wish me luck!